Home Social Media Why Do People “Like” Facebook Pages? Why do people “like” Facebook pages? It’s very important for businesses to know the answer to this question. When someone “likes” a page on Facebook, their friends are more likely to become interested in the page as well. Facebook is a very influential medium, so it’s important that brands understand what makes someone want to “like” a page. According to a study by Burst Media, half (49.1%) of the people surveyed said that they proudly display brand loyalty online, and will frequently or occasionally “like” or follow brands on social media. 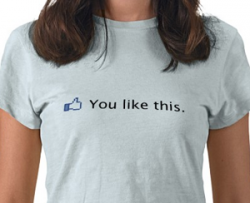 58.1% of all 18-34 year old men and women who participated in the survey “like” brands online. 39.3% of people said that they followed a brand to show support for it. The survey found that 58.1% of mothers (defined as women aged 25-54 with a household size of three or more) follow brands on social media, and 50% of these mothers do so to keep up with the latest products and services from brands they like. 46.7% of women who are not mothers follow brands for special offers, discounts, and/or promotions. 40.1% of mothers and 19.4% of men follow brands for this reason. This shows that offering discounts and coupons on your brand’s Facebook page pays off. I was intrigued to learn that 65.5% of the people surveyed said that brand mentions or promotions by bloggers influence their buying decisions. Within the 18-34 age range, 81.2% of men and 79.8% of women are influenced by bloggers. 74.4% of mothers said that they read blogs and base decisions on bloggers’ opinions. 62% of the people surveyed follow blogs and other content sites on Facebook, Twitter, and other social media. 44.0% of women and 30.7% of men follow these site because it’s fast and easy. A study by HubSpot shows that companies that auto-publish content to social media yield 50% more leads than companies that don’t. Additionally, the study finds that companies that use a social media publishing tool to schedule social media posts had 3 times as many leads as those that don’t. According to the Burst Media survey, 25.4% of people (including 31.7% of moms) are more likely to follow a brand on social media if they see the brand in an ad on a blog or other content site. Nearly half (46.2%) of respondents say recommendations made by social media friends are either very or somewhat influential with regards to brand preferences and purchasing decisions. 60% of respondents aged 35-44 say social media friends impact their brand preferences and purchasing decisions. This number is 50% or less among all other age segments. Influence by social media friends is especially important on Facebook. When a user “likes” a brand page on Facebook, their friends see this action not only as a story on the News Feed, but also as a brand badge on the user’s profile page. Why do people “like” Facebook pages? To show loyalty to brands, to stay in the loop about new products and services, and because of recommendations by bloggers, friends, and advertisements. More importantly, people “like” Facebook pages because brands give them a reason to.